All parts are made in the USA by military contractors. 6 position tube is made from 7075 T-6 aluminum. Buffer is a standard weight carbine buffer. 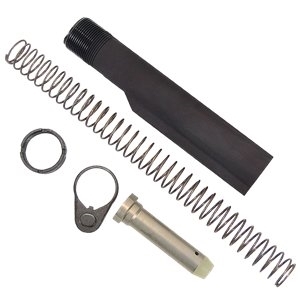 The spring is carbine length Zinc coated. End plate and castle nut included. Outstanding kit! Exceptional value and high quality. Would buy again if needed. Bought this and a magpul stock. Fit like a glove.